No matter what one's methods of speculating in the market, Livermore advises that one be flexible. The market's action may change. As such, it is no good to have a method that continues to lose money just to remain consistent. As bear and bull markets come and go, the speculator must adapt, as did Livermore when he attempted for the third time to avoid losing all his money upon his return to New York. 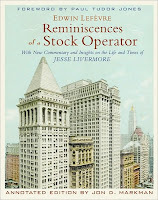 As Livermore changed his methods as he tried to transfer his success from the bucket shops to the exchanges, he found that he now had to be more anticipatory as opposed to reactionary. Previously, he would simply study the ticker's past price changes to make his decisions. With the execution delays inherent in real trading, however, Livermore now had to anticipate the market's movements. He would do this by reading trade reports, railroad earnings, and financial and commercial statistics. Livermore says that most of the market's speculators lose money. Some learn from their mistakes, but most others graduate to a level where they learn the conventional wisdoms that continually lose them money. It's those that can get past those so-called wisdoms that can truly profit, according to Livermore. One example of this has to do with profit-taking. Conventional wisdom argues that no one has ever lost money taking profits (selling after a small gain). But Livermore argues he has made more money by sitting (on a position) than by thinking alone. It's easy enough to be right about the direction of a stock, according to Livermore, but the kind of person that can both be right and sit tight is uncommon and is the kind of person that can make real money in the market.